Walking to church-choir practice at dusk this evening, I shot this view of a car approaching as I studied a new utility pole that AT&T has erected on South King Street. 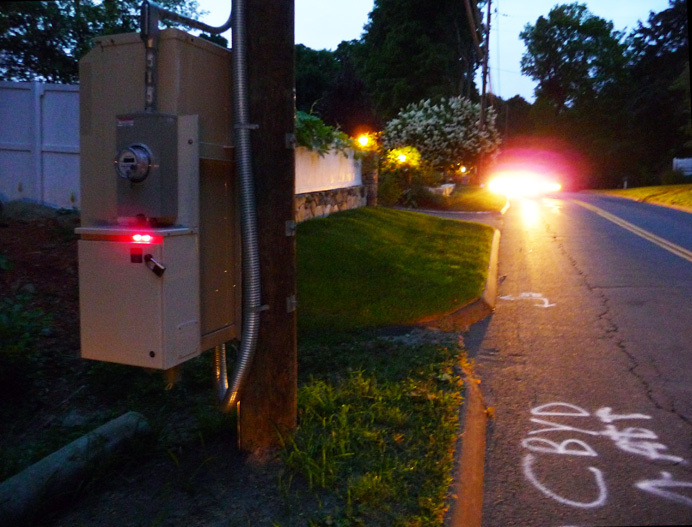 The big box with the red indicator lights is bringing TV signals to the neighborhood via the telephone lines. That means competition for Comcast Cable. Some of us are delighted: we're fed up with Comcast's tricky bundling and predatory pricing. (Now, if we could just do something about the quality of the shows...) .